An Italian megastore it is indeed! Boasting several restaurants, Eataly houses long aisles of olive oil, handmade pasta, an amazing selection of cheeses, seafood, and meats. If anything makes me feel like a kid in a toy store, this place does. We made two visits to Eataly during our stay in the city. We truly had the full New York experience when we ended up there at 4 P.M. on Friday afternoon. To describe the space as crowded would be a spectacular understatement. Fighting shoulder to shoulder shoppers challenged our effort for a late lunch. We finally managed to grab a fabulous sandwich with roasted tomatoes, fresh mozzarella, and pesto on a crusty baguette and one of the best cappuccinos I’ve had. Our second visit on Sunday afternoon proved to be a bit more relaxed. I resisted the temptation to buy everything in sight, knowing that we’d be boarding a plane shortly. We made our way to the bakery and nabbed a couple of focacce: one with apple and cinnamon and the other with banana and chocolate chips. We barely made it out the store before both were gone. As we made our way back to Atlanta, I promptly committed to making my own version of banana and chocolate focaccia. This flat Italian bread, similar in texture to pizza dough, typically features savory flavors. I was excited by the variation of using fruit, and for today’s post, I’m sharing my “Eataly-inspired” Banana, Walnut, and Chocolate Focaccia. 1. Whisk flours, salt, and 2 tablespoons sugar together in a medium bowl. In a separate small bowl, whisk together water, yeast, and 1 tablespoon sugar. Set aside for 5 to 10 minutes until yeast activates and creates a foam on top of liquid. 2. Transfer flour mixture and liquid to the bowl of a mixer. Using a dough hook, mix and knead for 7 to 8 minutes. If mixing by hand, combine ingredients in a large bowl and stir with a spoon until dough forms. Transfer dough to a floured surface and knead by hand for 7 to 8 minutes. 3. Coat a large bowl with 1 tablespoon of canola oil. Transfer dough to bowl and roll over to coat dough with oil. Cover bowl with plastic wrap and place in a warm place for 1 to 1 1/2 hours until dough has doubled in size. 4. Pour 1/4 cup canola oil onto a 12x17 inch baking sheet and spread around. Transfer dough to baking sheet and begin spreading and stretching dough to fit the baking sheet. Turn the dough a couple of times to coat the dough with oil. Spread your fingers and begin to press deep dimples into dough. It's okay if you create a few holes in the dough. Place baking sheet in a warm place and let rise again for 1 hour or until doubled in size. 5. While dough is rising the second time, preheat oven to 425 degrees. When dough has risen, place banana slices on top of dough. Spread walnuts and 2 teaspoons sugar over dough and place pan in oven. Bake for 20 to 25 minutes until focaccia is golden brown. 6. Remove from oven and cool for 10 to 15 minutes. While still slightly warm, spread chocolate chips over focaccia and serve. Focaccia can be eaten warm or at room temperature. this looking so yummy, I will definitely try this recipe. What fun it is to recreate a recipe that you’ve enjoyed elsewhere! 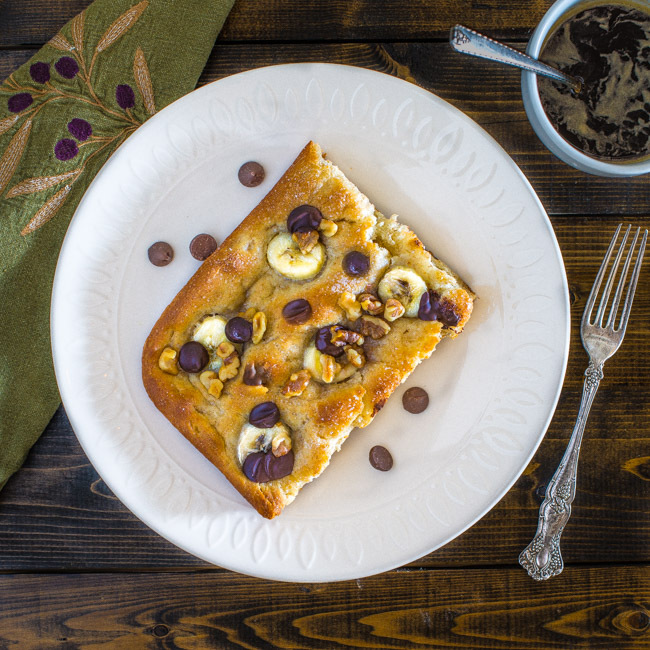 This is an interesting and unexpected foccacia with the bananas and chocolate. I just love it!!! If I ever make to NY, I’ll be looking up Eataly, that’s for sure. Wishing you and your family a very wonderful holiday season! Thank you, MJ! Definitely make it by Eataly if you’re in NY. Hope you have happy holidays as well!! Thanks, John! Hope you have wonderful holidays! Great to hear from you, Jeff! I hope you have great holidays!! I discovered Eataly on a trip there in 2013 and was blown away. With all of the food places in NYC, we also went there twice to eat. Didn’t notice the banana and chocolate chip foccacia, but this looks delicious. Thanks for sharing, and Merry Christmas! Thanks for dropping by, Jane! Hope all is well with you and have a very Merry Christmas! YEAH! Jealous that you got to go to Eataly — I still haven’t been but NEED to get there. And I’m loving this sweet riff on focaccia. I see myself eating it on Christmas morning. Nicely done, Bill! Thanks, Julianne! You definitely need to go. You’ll be in heaven! Hope you guys have great holidays!